If only someone had told me…. That was the thought that kept running through my mind as I went through the recruiting process with my son Sam. So I am here to tell you all the things I wished someone had told me before July 1st. According to NCAA rules July 1st is the day coaches can contact your son or daughter directly, though the rules about Facebook and texting are fuzzy so they might be contacting your child directly even sooner. Of course the singlet, sweats, shoes and more that each school gives its wrestlers were on display as part of the tour. Then there’s the charisma. Imagine how a young man feels when an Olympic gold medalist or an NCAA champion is their new best friend. I am an adult and as a wrestling fan admit to being star struck by more than one head coach. The tough part is to look beyond the promises, to take off the rose colored glasses and to see a school and a wrestling program as it really is. Don’t be shocked by the compliance letter you must sign before the visit. This is where they let you know that there’s no drinking or other illegal activities. One school even specified “no strippers”. I don’t want to know about the incident that led to that being spelled out. I am not naive enough to think that college students don’t drink, but we talked about which schools had team members who drank at parties during the recruiting trip and that factored into Sam’s decision. The NCAA allows five official visits. On an official visit schools pay for the recruit’s travel to and from the school (parents are on their own). They pay for the parent’s and the recruit’s hotel and meals, though at some schools the recruits stay with team members. Even though they are mandated at no longer than 48 hours, the trips can be exhausting. But take advantage of them even if your child has a school in mind. It is good to compare and contrast. At one point Sam thought he had found the right school and wanted to cancel the rest of his visits. We persuaded him not to cancel. The school he chose was the one he visited last. This is a high-class problem, but don’t underestimate the stress and pressure of the decision. Sam, who is a laid back young man, broke out in a rash just before his final visit. It’s the biggest decision of their young lives and they want to get it right. To that end we helped him with a “decision dinner”. Sam, his father, his high school coach, Mike Powell and I took several hours over dinner. We made a scorecard of sorts giving points for various characteristics such as overall academics, academic support, student/teacher ratio and on the wrestling side, coaches stability, teammates likability and history of success. The points didn’t really matter but the categories spurred good discussion. By the end of the dinner Sam had his answer. He did not pick the school that offered the most money and we are okay with that – it’s not that we’re made of money, far from it, but we want Sam to be happy and productive above all else. We asked Sam to call the schools who had recruited him that he did not chose, immediately after calling the coach whose team he will join. That was a good thing. By the time I had gotten home from the “decision dinner” word was out via twitter and then a wrestling website. Oh, yes you’re probably wondering - Sam gave his verbal commitment to the University of Iowa. Go Hawkeyes! Thanks for this article! My son is a sophmore football player and wrestler. He got into wrestling to help his football career and ended up getting his varsity letter in wrestling as a freshman and just last night, first match of the season, he won 13-0. Now his coaches are saying he could go to states. We always thought that if he was recruited it would be by a football program, now we are thinking that wrestling my be his ticket to college. The entire recruiting process has me baffled so this article was helpful! Thanks for your insight! And as I drove to work and saw wrestling shoes in my passenger seat, I was so happy to realize that wrestling season is upon us! Best of luck to your son! Best of luck to Sam! This was interesting. Thanks for sharing your thoughts, Caryn. I’m happy that Sam chose Iowa and I wish you all the best of success in the coming years. Congratulations to Sam and all the Brooks family. Sam has chosen a great academic school and the best wrestling school in the country. Go Hawks. Wlcome Sam to your new family THE IOWA HAWKEYES! You will never regret the opportunity I know that my son Tony never looks back and thinks would if…. 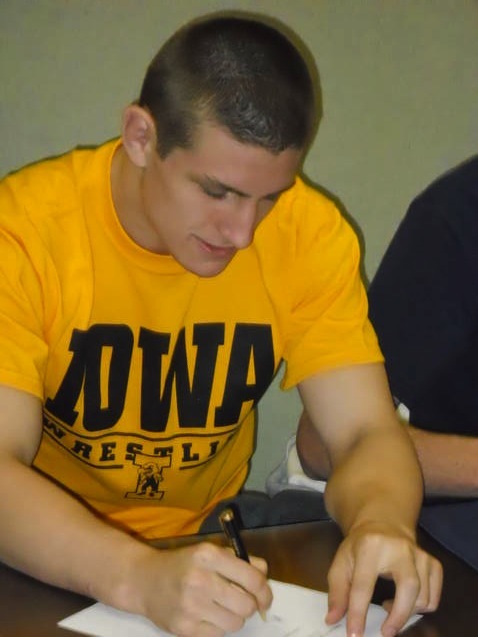 Thanks for the article and welcome to the Hawkeyes! I look forward to cheering you and your teammates on for the rest of your career and beyond! Thanks to all the Hawkeyes for the kind welcome. Sam is thrilled and so am I. Good to hear from you Caryn. There were many things we wished we would have known before as well. As a parent, I enjoyed meeting other parents of these outstanding young men while on the recruiting weekend. One thing we also expressed to our son (Topher Carton) was that he needed to remember that wrestle or not, he still has to go to school there, so don’t over look the academics. We are also thrilled that Topher and Sam will be teammates. Go Hawks. Welcome to the Hawkeye family. It’s very impressive how you guys did your homework and realized that the money aspect is only one part of the decision. I look forward to watching Sam on the mat, and know that our coaching staff will help him grow into a productive man off the mat. Welcome, Sam and the entire Brooks family. Go Hawks! !